This app is so wonderful and exquisite in every way!!! Entirely worth 14.99 this app should get many awards!!! I LOVE YOU ABRAHAM AND JERRY!!!! These meditations are so perfect. They are great to listen to at night before bed. Even if you do not know anything about meditation, it is ok. Abraham guides you into the feeling place they are aiming for gently and perfectly. I recommend these to everyone. My life is changing in a wonderful positive way. I listen to these every morning before starting my day. Thank you for leading me to these. The meditation's way to help one breath in synch with one's cells and the universe is fantastic -- and so healing. I absolutely love this app. I can listen anywhere, any time I have a few spare minutes. Perfectly produced. Love it! Love It! Love It! I use it every day and have had amazing results.I use it the minute I come home from work each day. I can feel my body letting go of resistance with each moment of meditation and the stress just melts away. When I finish I am completely relaxed and energized at the same time. It was easy to order and it downloaded in 59 seconds, with no problems. This is an iPhone / iPad app. If you have one of these devices you know what 'sync' means. If you do not you will not be able to use this application. It is not made to use on your computer, but rather to be downloaded to your computer, then 'sync'ed (transfered) onto either the iPhone or iPad. I bought this app and it works flawlessly on both my iPhone and iPad. If you want to raise your vibration and allow your life to get better and better, this is a wonderful meditation experience. Absolutely worth every penny. Accessible and convenient to help you shift your thoughts to a positive direction in any sphere of life you are experiencing challenges (money, health, love, general well-being...). Love it being so easy to use-both text and audio-and on my iPhone. I first bought it as mp3 files. But an app on the he phone is so much more convenient. If some one can upgrade this app it would be wonderful. :) Thank you. Excellent App! I LOVE this app. With this app in my pocket, I have the opportunity to access a calmer, more peaceful state of mind ......anywhere, anytime. Looking forward to having 15 minutes of wait time......break at work, soccer practice, at car mechanics, picking up kids, waiting for prescriptions, etc. No more excuses! My guided meditation practice just became more doable. Brilliant idea. 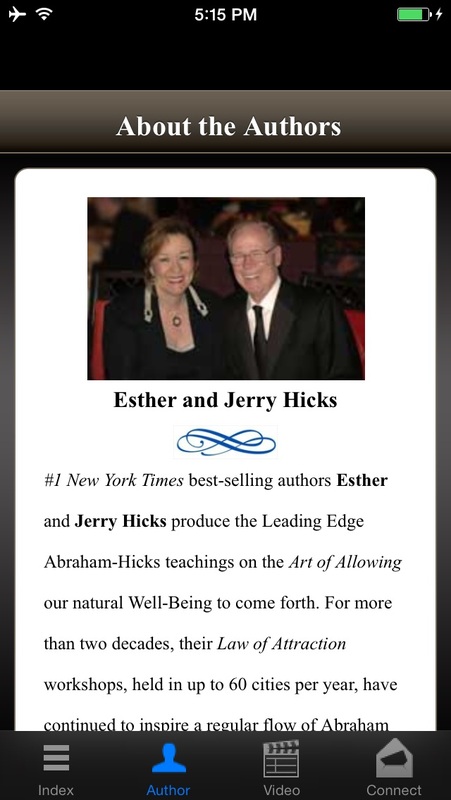 Thank you Abraham and Esther & Jerry! Love the meditations, however the sound quality is terrible with hissing and crackling like an old vinyl album. Would get 5 stars if they could make a modern clean digital recording. It's been less than 24 hours since purchasing and listening to this meditation series and manifestations of resources, love and repairs have already taken place. What an incredible transformation that takes place once your are in alignment with your Source of all Energy!!! I have been awakened!!! Thank you Abraham!!! More hype than substance. Way overpriced. Sorry I downloaded it for $14.99. These guided meditations have been amazing for both myself and my young daughter. She is 7 now, but since her first listen at about 3-4, she will request them at both bedtime or after periods of emotional distress. Often she falls asleep, but the first 7 minutes (of guided breathing and positive affirmations, accompanied by almost- lullaby music) are perfect for transporting one into "the Vortex"... Highly recommended for even the most hyper child, and the racing mind of anyone 3-300 years old! Ignore that 1st review. The APP is great! It is true there is no explanation of the "SYNC" icon but I clicked it and it appeared to look for updates to the application and took about 5 minutes to do it. While updating the APP is busy but if you get impatient just click CANCEL and do it later when you are not in a rush. The app is much like the book except it makes it available on your mobile device. I love the bonus meditation track which is the same as the other tracks but without words. The book has expanded my meditation practice to a daily ritual after years of trying to get into it unsuccessfully and now the APP will keep it with me all the time. I give it 5 stars because there is nothing out there like it. I just ask that they come out with an iPad Hi Res version soon so it looks nice in the iPad. My mom and I love this stuff. We do it all the time and this vortex thing is our favorite of all the Abe we've done. Mad props to the app developer because this one does everything a cool app should do. It's awesome to be able to get this kind of info in an app! To that first reviewer, is this like your first time using an app, dude? That's cool, but spend some time with it before you trash it. This is a very very cool app that can really improve your life if you give it a chance. The content of this application is magnificent. The meditation music, Abraham's comments, the rhythm of it all, and the effectiveness of it are all wonderful. The application designed is not very comfortable in mainly in two reasons. The first is that the text of the instructions is very small and I had to use a magnifying lens to read it; it is not resizable and has no landscape mode. The second is that one has to read through the same lines of text to locate a meditation because they are not recognizable one from the other at a glance. After reading the guides once or twice, every time I am going to open this application it will be for the meditations, so it would be nice if they were easy to locate within the application. I use this often and find it helps me shift through my day. I LOVE ABE! I am so pleased to have this app. It is wonderful. Good, but $14.99 was way too much for what I got. $4.99 would have been a better price. This is similar to other $4.99 apps. So save yourself some money and buy those instead. 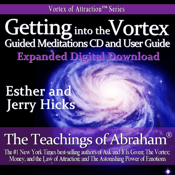 These guided meditations have changed my life and become part of a daily meditation ritual. I hope the are as helpful for you as they are for me! Peace. Use it all day he time. Love it! Love this app and concepts and have been using it regularly now. Life has been great! Get into the vortex and then.. I heard about the meditation series through various mentions in seminar audios. I was confused as to if this was the same thing/why it was in app form. 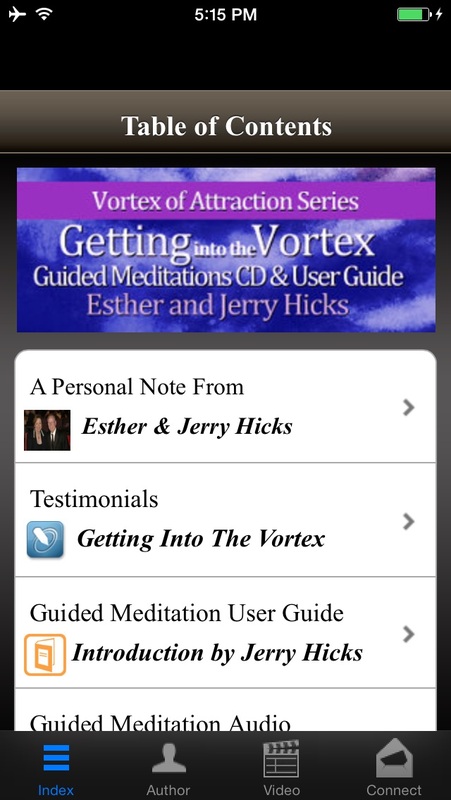 But yes, this is all the different guided meditations pre loaded. They always raise my vibration and I'm thankful for the ease I feel while listening. Get this app. For more than 25 years my life was hunted... It's so funny how even the pastor couldn't understand my battle... I'am at PEACE! Thank you for your Meditation Guidance. I ALSO JUST PURCHASED THE GUIDED MEDITATION APP FOR MY IPHONE, BUT I DON'T UNDERSTAND HOW TO DOWN LOAD IT ONTO MY IPHONE AND ONTO MY IPOD. I AM EAGER TO START LISTENING TO IT DAILY. I am so happy to find this app for my iPhone!! The cost easily pays for itself. I had to carry around my book/cd and CD player when I went away from home. It was a pain!! Now it's on my cell phone which I carry with me always. This is one of THE easiest and most effective purchases I currently own. I love the meditations and readings! It has changed my world by simply listening to it. It has taught me to 'let go' without even trying! 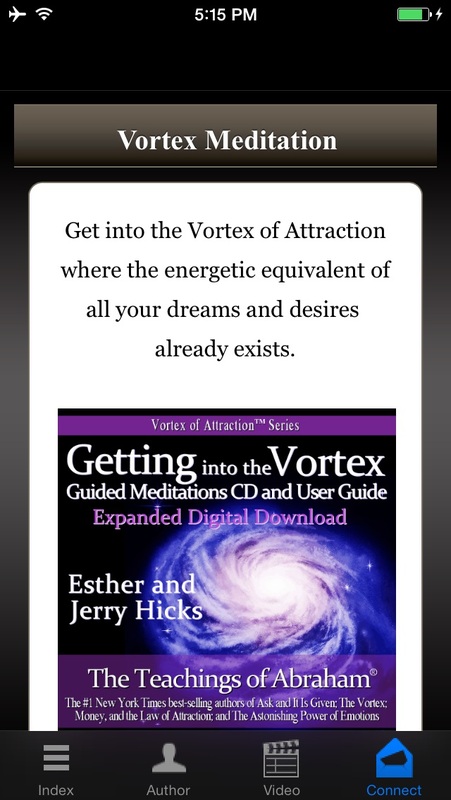 The rest takes care of itself IN THE VORTEX :-) Thank you for making it available!! The best meditation app on the planet! The flow of empowering words and that mesmerizing music is delicious! Such sweet surrender... Ahhhh! My daughters (7,2) listen to these "songs" every night before bed. The immediate calming energy along with complete aligned phrases takes me right into the best state of being I have ever experienced so far in my journey. I have listened to these meditation enough that they are programmed fully in my subconscious and come out in my thoughts at the perfect time. These mediations have helped me re-pattern my thoughts enough to create an "obvious tipping point" throughout my whole life. Anyone who is guided to these meditations for whatever reason will forever be changed in the best of way. Well worth every cent and more! I actually don't feel you can put a price on how valuable these mediations are. Do Not Buy! Undocumented Functions! I am so grateful for having stumbled onto her teachings somehow on YouTube. Listening to this woman on a daily basis has helped me improve my own life in extraordinary ways. She has helped me discover that we are God aka Source energies creation, therefore we are gods children and him being out father, we are always gifted with traits of our father, and his energetic combination with earth makes us physical beings, Therefore earth is our mother and he is our father. God created us, lastly We have his power within us and we can create everything we want in our lives to happen. It's in our genetic DNA .... Also doesn't that really mean we have the power to heal ourselves. Great ideas but pls make it a choice for music. I don't like music in meditation. Please remove it. Bought today. Can listen to intro but can't get to the meditations. If an app was built in 1990 it would look like this. Recently this app even stopped working since it looks like someone forgot to renew a cloud based hosting. This app is not reliable and clearly developed by someone on a very tight budget or with very rudimentary skills. Extremely relaxing and the user guides for each meditation explain the details and meaning of the phrases spoken. I listen from bed when I first wake up. Easiest way to improve my life and only takes 15 mins a day! I have already received more than the $15 investment, many times over. I love this APP! Even people who aren't familiar with Abraham will love it! It's perfect to fall asleep to! It's really beautifully done!